Bubs and I got some new shoes last weekend. From Pumpkin Patch. 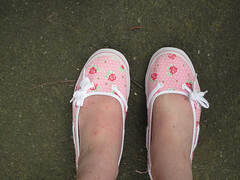 She got some cute lavender spotty numbers and I got these sneakery/boat shoes. I don’t let the fact that my new shoes are aimed at 5- 11 year old girls rain on my floral parade. My little shopping outlet was floral in tone. Nice rose bedecked tank dress from Jay Jays. Heck it’s gotta be either roses or sequins these days to take my fancy. Or some variation on a black cardy, shrug, over top. First sight as we cross over: a guy urinating against a fence. Is he in shorts, a kilt or has he just lost the bottom half of his trousers during the course of his day? Anyone’s guess. It’s mid-afternoon. The girls are starting to stagger and the guys are starting to pick fights with each other. We got our first sighting of that Cup Day icon – a drunk woman in a mini-skirt carried out by two blokes and followed by security – about an hour earlier. It’s when the event stopped being sedate and started to become its opposite. Try to put your finger on the mood out here in no-man’s land. It’s about nothing but drinking. Police and bored security guards lean against a fence, waiting for taunts and play-fights to get serious. It’s Show Day in Christchurch, often a scorchingly hot one but today it’s nippy and having a relaxing at home day watching Star Trek, eating Twisties, drinking Coke and sifting about. Lovely really. And hopefully at some stage over the long weekend we’ll make it to 2012. Disaster squared, exponential, and to the max. A comic about mathematics and Bertrand Russell? Old people tooted revved and tried to run me over outside Farmer carpark so I smiled, turned and waved as if I was the Queen. Regal serve! Oh and my three copies of Ivanhoe arrived this week.